June 23rd in Wordpress Plugins by Wordpress Jedi . Here is another plugin that makes it easy to create sophisticated price estimation forms for your WordPress site. 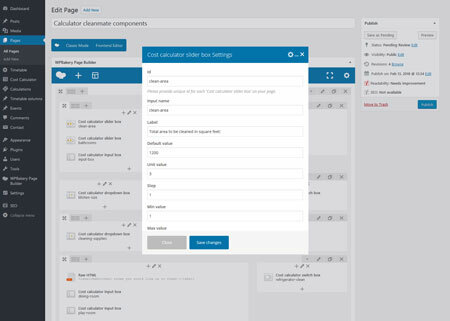 Cost Calculator comes with a page builder that lets you build your own form via drag & drop. You get many predefined responsive layouts to choose from. 3 skins are available but you can customize the colors and fonts. Cost Calculator comes with a bunch of useful components such as dropbox, slider box, and date picker. It allows you to store calculations in your database. You get convenient features such as color picker, shortcode builder, and customizable template/font options. Cost Calculator is Visual Composer (WPBakery) friendly. The shortcode builder lets you display custom layouts on your site. You can use this plugin to create cost calculators for car repair, home renovation, and other similar projects.